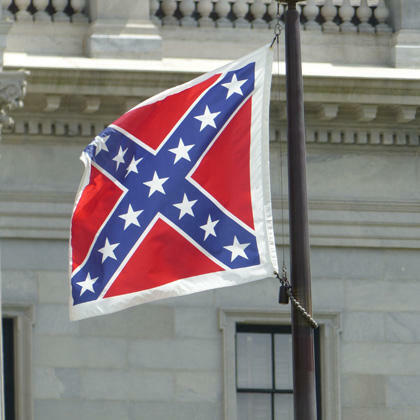 The Confederate battle flag on the grounds of the South Carolina State House, July 9, 2015. South Carolina Governor Nikki Haley’s signed into law Thursday afternoon a bill that removes the Confederate battle flag from the grounds of the State House. With the shooting deaths of nine African-American worshipers in Charleston’s Emanuel A. M. E. Church on June 17th, and the discovery later that week that the accused gunman, Dylan Roof, now in custody, had posted on-line pictures of himself with the Confederate Battle Flag along with a racist “manifesto,” a growing, public opinion against the display of the flag at the State House memorial for the Confederate dead resulted in Thursday afternoon’s event. The bill, approved by the South Carolina Legislature, removes the flag to the Confederate Relic Room and Military Museum. Final passage of the bill came early Thursday morning. The flag will be lowered Friday morning at 10:00 am. This special coverage is a production of South Carolina ETV Radio: South Carolina Public Radio.